April is a song, dance, movies and more kind of month. There are multiple opportunities to hear all kinds of music — from Indonesian to Broadway to American to electronic. There’s a puppet show, a poetry reading, events for expanding your mind and your spirit. Better yet, most of the April events on Emory’s campus are free. 1. Celebrate National Jazz Appreciation Month. 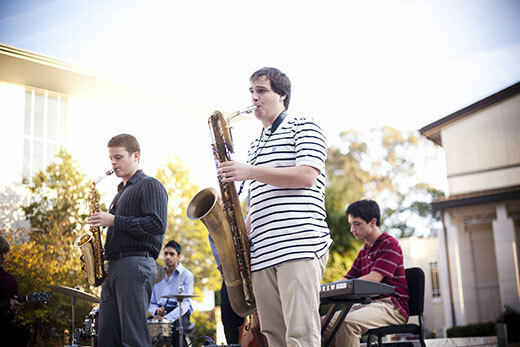 April is National Jazz Appreciation Month and Emory Jazz Combos perform on Tuesday, April 3, at 8 p.m. at Emerson Concert Hall in the Schwartz Center for Performing Arts. Then, Jazz on the Green returns, beginning Thursday, April 12, and again on Thursday, April 26. Both outdoor performances are at 6 p.m. on Patterson Green at Goizueta Business School. All three performances are free. April is a very musical month at Emory and you can find music to suit any taste, with almost all performances free. Check out the Arts@Emory calendar for concerts and recitals that offer a variety of genres. 2. Kick it up a notch on National Walking Day 2018. Join in the organized walks on Emory’s campus on Wednesday, April 4. Answer this call-to-action from the American Heart Association to increase your physical activity and well-being by participating in your choice of more than two dozen walks on Emory University and Emory Healthcare campuses. Thousands of people across the country will be walking, too, on this sponsored day. This activity is free. 3. Unravel the mystery of the Great Sphinx at Giza. This Egyptian Wonder of the World has been dazzling people for centuries. Come to the Michael C. Carlos Museum’s Ackerman Hall on Thursday, April 5, at 4 p.m. to enjoy afternoon tea and scones at the museum’s monthly AntiquiTEA event. Gay Robins, Samuel Candler Dobbs Professor of Art History, will discuss the different forms of this half-human, half-Big Cat, which alternate between protective and aggressive. 4. Learn about the Tibetan government in exile and its future goals. Sikyong Lobsang Sangay, president of the Tibetan government in exile, will speak on Monday, April 9, at 7 p.m. in Tull Auditorium, Gambrell Hall, at Emory Law. His topic is "The Tibetan People’s Transition to Secular Democracy." The talk is free and open to the public. 5. Enjoy a feast for your eyes with StageWorks 2018. These musical performances feature Emory students in costume performing selections from operas, including Mozart’s “The Magic Flute,” and Broadway musicals, including “Guys & Dolls.” The free event is Friday, April 13, at 8 p.m. in the Performing Arts Studio on North Decatur Road. 6. Experience the art of shadow puppetry. “Wayang Kulit: Shadow Puppet Drama” is a form of puppet theatre art from Indonesia and other parts of Southeast Asia, telling a dramatic story through the shadows thrown by puppets. The story will be accompanied by the Emory Gamelan Ensemble's live music. Gamelan is the traditional ensemble music of Java and Bali, made up predominantly of percussive instruments. This free performance is Saturday, April 14, at 8 p.m. at the Performing Arts Studio on North Decatur Road. 7. Exercise your “rite” to celebrate spring with music and dance. “The Rites of Spring” features Vivaldi’s “Spring” from the Four Seasons and Stravinsky’s ballet “The Rite of Spring.” Performers are pianists Robert Spano, Atlanta Symphony Orchestra music director, and Elena Cholakova with original choreography performed by Staibdance and ImmerseATL. The free concert is Saturday, April 14, at 8 p.m. in Emerson Concert Hall of Schwartz Center for Performing Arts. 8. Attend the premiere of a new PBS series. On Tuesday, April 17, at 7:30 p.m., the Michael C. Carlos Museum and Georgia Public Broadcasting will screen the first episode of the new PBS series “Civilizations,” which explores the power of art from earliest civilizations to the present. The nine-part series was inspired by Kenneth Clark’s landmark 1969 series on Western art; it will be narrated by actor Liev Schreiber. The free screening will be held in the museum’s Ackerman Hall. 9. Enjoy a free movie and snacks. Dooley After Dark presents “Star Wars Episode VIII: The Last Jedi,” open to the Emory community, on Friday, April 20 in Harland Cinema. Doors open at 8:30 p.m., and the free show starts at 9 p.m.
10. Transform your thinking and learn how to handle fears and insecurities. A talk by Sister Joan Chittister is based on her book “Radical Spirit” that offers a practical program of 12 simple rules for healthy spiritual living. Chittister is an enthusiastic proponent of spiritual enrichment and a passionate advocate for social justice. She gives her free talk on Sunday, April 29, at 7:30 p.m. in Cannon Chapel.